This post will cover the film locations from the closing moments of the documentary “Malayan War Record: A Record of the Offensive” (or Mare Senki: Shingeki no Kiroku) — Changi Prison, Johore Battery, Labrador Battery & Keppel Harbour. After the fall of Singapore, on the morning of 17 February 1942, some three thousand European civilians were assembled on the Padang for the march into internment. They were first instructed to walk to their first internment camps in Katong and Joo Chiat. By the first week of March, the civilian internees had been moved to Changi Prison, where most of them were to stay until May 1944 (when they were next moved to the Sime Road Camp). “チャンギ刑務所” – Changi Prison. Film-stills from the documentary. Entrance gateway of the Changi Prison, where European civilians and prisoners-of-war were interned during the Japanese Occupation of Singapore. From the National Archives of Singapore: VIEW OF THE MAIN ENTRANCE TO THE JAIL AT CHANGI, SINGAPORE, DURING WORLD WAR 2, WHEN THE JAIL WAS USED BY THE JAPANESE TO HOUSE CIVILIAN INTERNEES AND LATER, PRISONERS OF WAR. SHOWS THE PATHWAY LEADING UP TO THE GATE, 1940. 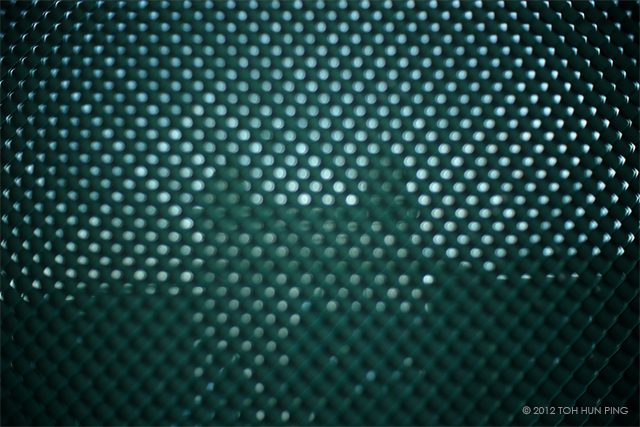 Film-stills from a panning shot of a Changi prison courtyard. 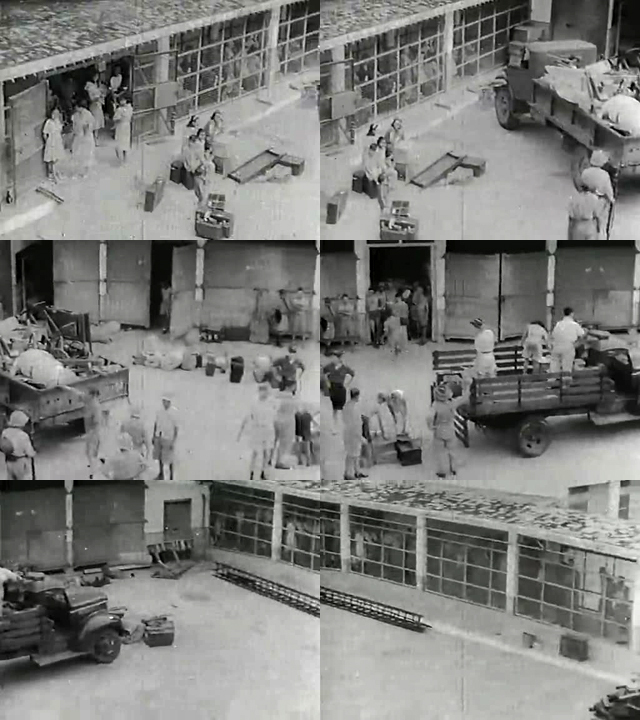 The civilian internees were unloading their belongings from the lorries. 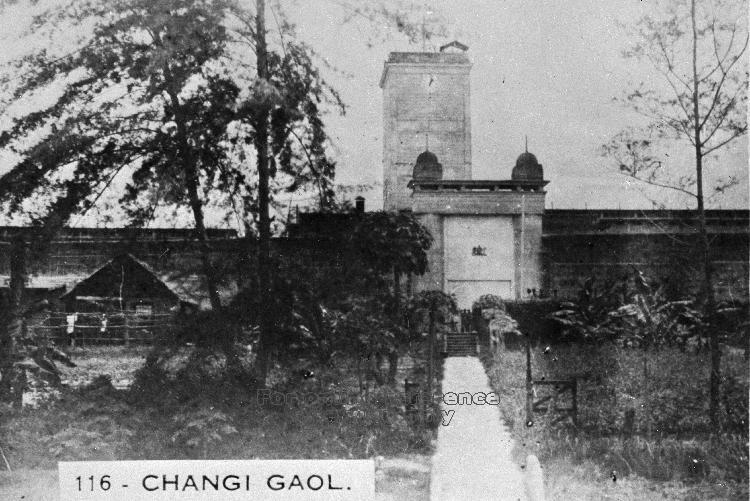 Changi prison. Civilian internees during the first days in the prison camp. The male and female internees were made to live in separate quarters. Many were making the most of out their predicament and brought along whatever belongings they thought would be useful during the internment. A Changi prison courtyard where civilian internees unloaded their belongings, watched over by prison camp guards. 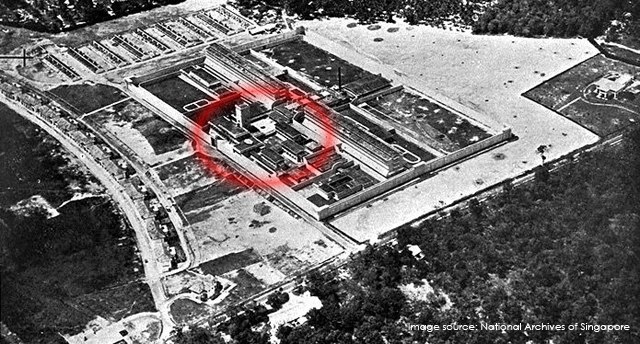 From the National Archives of Singapore: An aerial view of the old Changi Prison, 1936. I have marked out with a red circle, the entrance gateway and the adjacent courtyard space as depicted in the film-stills above. The old Changi Prison where civilians and POWs were interned during World War II was demolished in 2004, but the iconic entrance gateway was reassembled on a stretch of the wall of the new Changi prison. Today, there is limited access and visibility to this new prison wall. 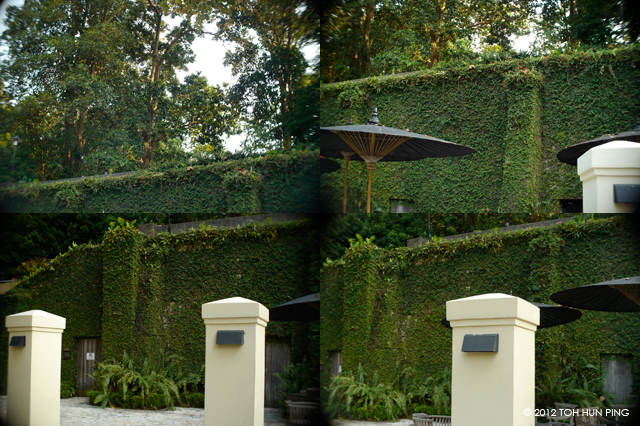 This photograph was taken behind the fence that borders the new Changi prison grounds. A rough silhouette of the old entrance gateway can be discerned. Through a hole in the fence. 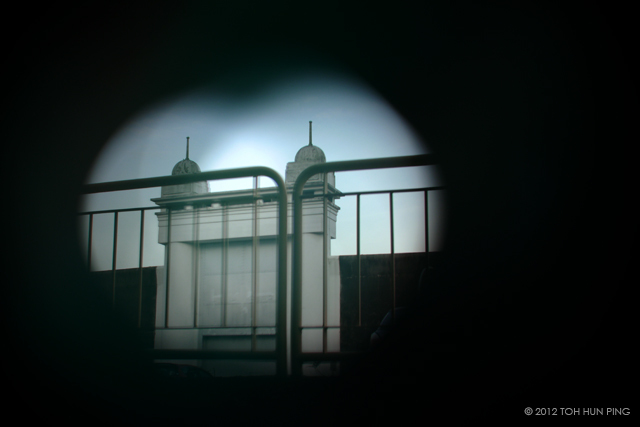 The old entrance gateway of the Changi prison. While the European civilians were interned at Changi Prison, the Allied prisoners-of-war were held in the former British barracks. The Australian POWs were stationed in Selarang Barracks while the British POWs were placed in Roberts Barracks. All three locations — Changi Prison, Selarang and Roberts Barracks — were within four to five-kilometre radius of each other, in Changi on the eastern end of Singapore island. The documentary contained a sequence where a motorcade was travelling along a road lined with many soldiers, presumably the Allied POWs. And when the motorcade stopped, General Yamashita emerged from the first vehicle to greet Percival who had been waiting for him by the roadside. This motorcade inspection by Yamashita was not commonly discussed in post-war literature about the Japanese Occupation of Singapore, but film footage of the event has been presented in a number of war documentaries. So, I have to make a speculation here — that the road which the motorcade had travelled on could be (Upper) Changi Road; the road that would lead one to the places where civilians and POWs were interned. It would also have been possible to organise all the allied POWs from the barracks in Changi to stand by the sides of Changi Road; for this event that was probably catered for the media. Media propaganda at work again. Yamashita’s motorcade “inspecting” the Allied POWs on Changi Road? Percival’s awaiting. On arrival (where? ), Yamashita extends his arm for a handshake. On the one hand, Yamashita humiliated the Allied forces by coercing the POWs to line the streets for his motorcade. On the other hand, Yamashita had a certain respect for the past achievements of the British empire, thus the friendly gesture towards British military commanders. Yet he must be thinking that the Japanese imperialists can do better. These film-stills are not from the “Malayan War Record” documentary. I have extracted them from archive footage presented in another war documentary “Singapore 1942: End of Empire”, but I believed that they are documentations of the same event, but possibly by a different camera crew or film production unit. 15. Yamashita’s inspection of former British military installations – Various locations, Gillman Barracks, Changi(?) and Johore Battery. Towards the end of the documentary, after Yamashita’s motorcade parade ended, he was seen to be inspecting the aftermath of the invasion at selected military bases or army barracks. 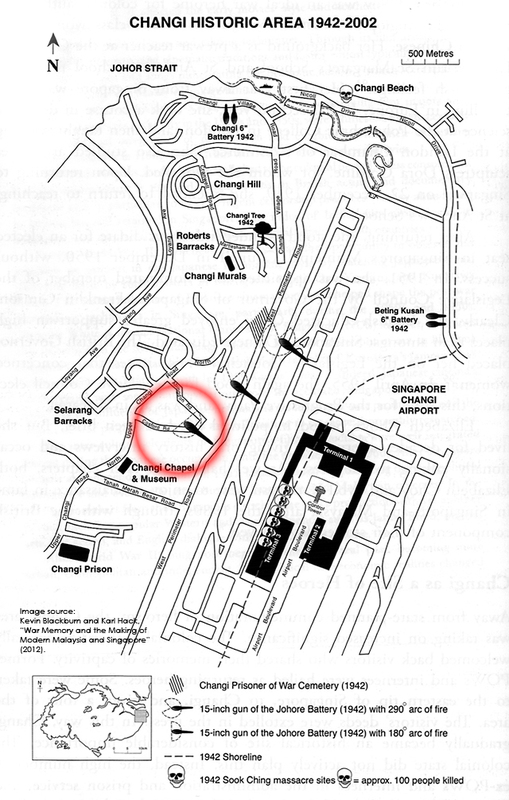 I was able to identify Gillman Barracks, and from the Japanese voice-over narration’s mention of the word “Changi” while the footage of the inspection is playing, that Yamashita could have visited the military installations in Changi as well (eg. Johore Battery). Yamashita inspects the former British military installations and the aftermath of the Battle of Singapore. Gillman Barracks is in the second row right film-still. One of the locations might have been Changi, in the vicinity of the Johore Battery which had three “monster” 15-inch guns for the purposes of defending the Sembawang Naval Base from a seaward attack. 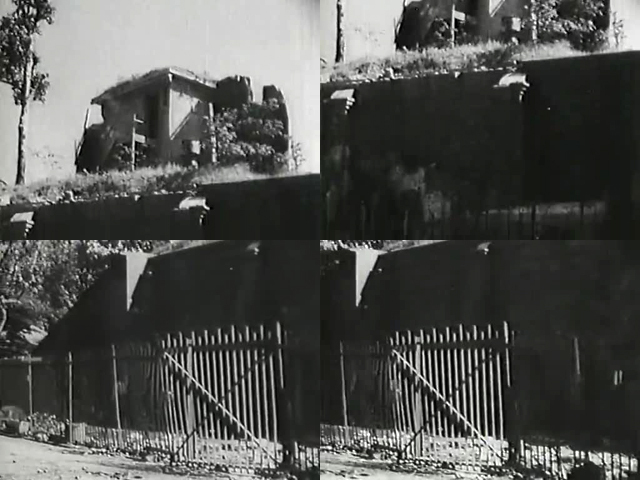 Film-stills from the documentary. Could this be one of the three “monster” 15-inch guns of the Johore Battery? (9 July 2015: Update –Mr. Peter Stubbs, who maintains an informative military history website, has concluded that the gun the Japanese soliders were on was the No.3 Gun (northernmost) of the Johore Battery. See his comments below. Out of curiosity, I paid a visit to the site of the former Johore Battery, where the Singapore Tourism Board had installed a same-size replica of one of the 15-inch guns, above the ruins of an underground ammunition bunker. It is located along Cosford Road amongst military camps and sits close to the runways of the Changi International Airport. 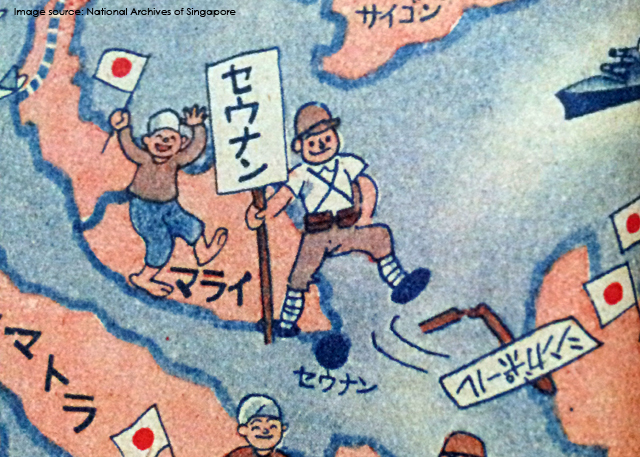 More military targets of the Japanese army and significant sites in Singapore are shown towards the end of the documentary, as if to announce control of these former British-administered places. You can imagine the military inspection team and camera crew having a list of places to visit and document — territorial prizes for winning the war. The state of the Labrador Battery after the British surrender in 1942. The casemate, which the British used as an ammunition store and shelter for the gunnners, was barricaded and locked up. The original purpose of the casement was to be a protective concrete cover for one of the two 6-inch guns positioned at Labrador Battery. The casemate of the former Labrador battery in October 2012. The tunnels in the casemate are now closed to the public. Ad-hoc visits can be arranged though. The area in front of the casement is now used by a nearby restaurant for al-fresco dining. I have wondered why is there a trend to turn former military installations into backdrops for upmarket dining, drinking and socialising? 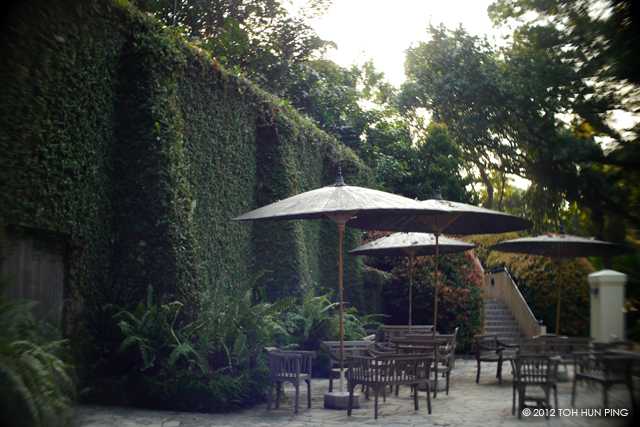 The “Bunker” restaurant at the Johore Battery. The “Eco Gourmet Cafe” at the Labrador Battery. The newly-opened art galleries and dining places at the Gillman Barracks. How about a Tengah Aerodrome Lounge Bar in the future? Or The Selarang Brasserie? From the Labrador Battery, it is merely a stone’s throw away from the Keppel Harbour (Singapore Harbour Board). The view from Keppel Harbour after the British surrender, as depicted in the documentary. The Normanton oil tanks in the distance continued to burn for many days after hostilities ended. By the way, I am on the look out for part two of the “Malayan War Record” (or “Mare Senki”) series. It is titled “Birth of Syonan-To” (or “Shonanto Tanjo”). Do let me know if anyone has a copy of it? Propaganda comics. The end of Shingaporu. The birth of Syonan-to. The end of the British empire. The end of the documentary. Part 2 – After The Surrender. This is Part 3 – Prisoners of War. This entry was posted in 1940s, Documentary Features, Japan-produced, Japanese-language Films, Singapore Geography, Singapore History, World War Two and tagged 1942, allied soldiers, australian army, british army, casement, changi prison, changi prison courtyard, changi prison gateway, changi road, civilian internment, cosford road, general perceival, general yamashita, gillman barracks, Ida Shinbi, indian army, japanese occupation, johore battery, Kameyama Matsutaro, keppel harbour, labrador battery, malayan war record, mare senki, monster guns, nipon eigasha, normanton oil tanks, prisoners-of-war, shingaporu, singapore, singapore harbour board, south pier, surrender, syonan-to, union jack, world war two. Thank you. Thanks for visiting the blog too! thank you for the fantastic study and presentation of this film! I’ve been meaning to add a comment for a very long time, so apologies for the delay. You have a most interesting blog. The part about ‘Yamashita “inspecting” the Allied POW’ is indeed on Changi Road at Changi. I’ve compared the film to maps and aerial photos and have concluded that, taking into account the date of the film, it cannot be anywhere else. The film of Japanese soldiers standing on a gun was taken at Changi. The gun they are on was the No.3 Gun (northernmost) of the Johore Battery. I came to this conclusion after examining what photographic evidence that there is of the destroyed guns and their locations. Thanks Mr. Stubbs! I have come across your website (Miltary History Pages) and your photographs on the ‘Good Morning Yesterday’ blog. Amazing collection of resources, maps, photos and self-made diagrams. And thanks for further confirming my speculations using maps and aerial photos. David Nelson’s book ‘The Story of Changi, Singapore'(1974) also offered information on Yamashita’s “inspection of the POWs” at Changi on the 25th Feb 1942. Do you have photographs of the Johore Battery No.3 Gun posted anywhere online? No photos on line, but I do have some if you want. Thanks Peter! If it’s convenient for you, I’d love to have a look at the photos of the Johore Battery guns. Also let me know how I can return you the favour.